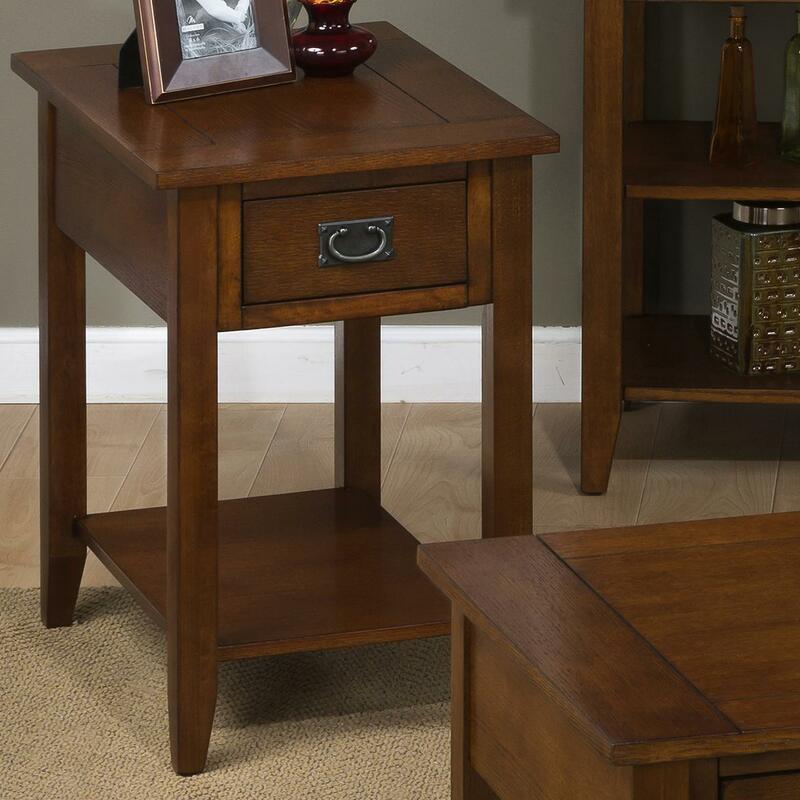 This stylish chairside table can complete the look of your casual style living room. 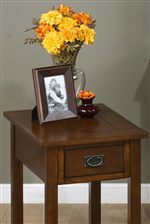 A smooth picture framed table top has cornered edges and a rectangle shape. Perfect for next to a recliner or sofa in your living room, this chairside table can hold decor, a book or anything you need close on hand. Storage is provided in the small drawer and bottom shelf. Casual with a hint of rustic, use this chairside table in your living room to make your space even more functional. The Mission Oak Chairside Table by Jofran at HomeWorld Furniture in the Hawaii, Oahu, Hilo, Kona, Maui area. Product availability may vary. Contact us for the most current availability on this product. Handles & Hardware Black mission drawer pulls with a rustic, industrial style. Case Detail Straight legs, corners and edges for a simple and casual style. Storage One decorative drawer and one shelf. Description: Top Smooth table tops with cornered edges. Case Construction Made of oak veneers with English dovetail construction for quality at an affordable price. The Mission Oak collection is a great option if you are looking for Casual furniture in the Hawaii, Oahu, Hilo, Kona, Maui area.